The radius is the larger of the two bones of the forearm, located radially. The distal end of the radius is considered as the three centimeters proximal to the radiocarpal joint, where the radius interfaces with the lunate and scaphoid bone of the wrist. A fracture of the distal radius can be caused by falling on the outstretched arm. The majority of distal radial fractures are closed injuries in which the overlying skin remains intact. The radius is the most commonly broken bone in the arm. For centuries they called this fracture a dislocation of the wrist but this description remains obscure. It was redefined by an Irish surgeon and anatomist, Abraham Colles, in 1814. Subsequently, the name of this injury was changed to a Colles fracture and the name continues to be used by surgeons. The wrist joint is formed proximally by the distal end of the radius and the articular disc (see below). The ulna is not part of the wrist joint – it articulates with the radius in two locations, the superior and the inferior radio-ulnar joint. Eighty percent of axial load is supported by the distal radius and 20% by the ulna. It is prevented from articulating with the carpal bones by a fibrocartilaginous ligament, called the articular disc, which lies over the superior surface of the ulna. Together, the carpal bones form a convex surface which articulates with the concave surface of the radius and articular disc. All the carpal joints are art. sellaris (sellar or saddle joint) and the radius the convex part of the joint is seen as an art. sphaeroidea (spheroid joint). There are several known ligamentous attachments to the distal radius. These often remain intact during distal radius fractures. 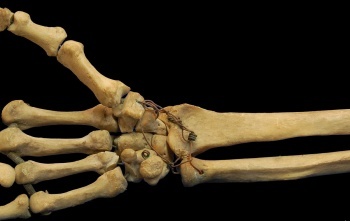 The volar ligaments are stronger and give more stability to the radiocarpal articulation than the dorsal ligaments. Distal radial fractures is one of the most common fractures of the upper extremity in adults, accounting for one-sixth of all fractures in the emergency department. It is seen predominantly in the older caucasian population. There is typically a history of a fall or similar trauma to the upper extremity. Pain and swelling in the forearm or wrist are common. Bruising and deformity in the wrist or forearm are also possible. This is an intra-articular fracture with subluxation or dislocation of the carpus bone. Of the eight grades for distal radial fractures in the Frykman Classification system, half include ulnar styloid involvement. Because the mechanism of injury for a distal radial fracture is usually a high energy traumatic incident, radiographs should be taken to confirm the diagnosis and ensure that the surrounding tissues are still intact. Other injuries causing radial sided pain may include TFCC tear or perforation, Galeazzi fracture (fracture to the distal 2/3 of the radius), scaphoid fracture, or radiocarpal ligament injury. Compartment Syndrome - Incidence of this complication affects only 1% of patients. Elevate, observe, and loosen cast immediately if compartment syndrome is suspected. Complex Regional Pain Syndrome (CRPS) - This complication is observed in 8-35% of patients. CRPS should be suspected when pain, decreased ROM, skin temperature, color, and swelling are out of proportion to the injury. In order to obtain a good functional outcome for this patient population, early recognition and a multidisciplinary treatment approach to address pain and function requires psychiatric and physical/occupational therapy interventions. Dupuytren’s Disease - Patients develop mild contractures in the palm along the fourth and fifth rays within six months of a distal radial fracture. The severity of the contractures determines the treatment course. Nerve Pathology – Neuropathy may present acutely or throughout treatment. The median nerve is most common (4%), however 1% of patients have ulnar or radial involvement. Physiotherapists may need to refer the patient to an orthopedic surgeon. Tendon Complications - Physiotherapists should be prepared to refer patients to surgery in the event of tendon complications secondary to irritation with inflammation or rupture from impingement. Capsule Contracture - Even after physical therapy treatment, some patients do not regain full forearm rotation due to contracture of the distal radioulnar joint capsule. Dorsal contracture limits pronation, volar contracture limits supination, and both may occur together. A DRUJ capsulectomy may be considered if functional ROM is not regained. Radiographic parameters are used to check the normal anatomy and to detect anatomical anomalies. The Gartland and Werley Score is an objective measurement to predict overall recovery. Grip Strength is an important outcome measure because it is an important function in daily activities. Grip strength can be measured with a dynamometer. Physical therapists must conduct a thorough physical exam including subjective and objective information. Subjective exam includes any information given by the patient such as pain experienced, limitations of ROM of the wrist and activity limitations. Objective exam includes assessment of wrist and digit ROM, grip and forearm strength, bony and soft-tissue abnormalities, skin integrity and nerve involvement. Be aware that the contralateral extremity may be an unreliable control. Health care professionals should evaluate the ligamentous integrity in the presence of persistent pain associated with suspected carpal instability as early as possible in order to avoid poor functional outcomes and prolonged recovery. 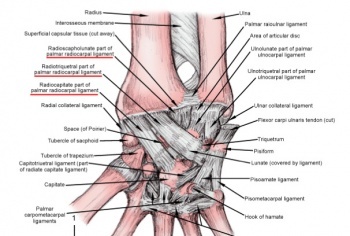 Specific fracture patterns and high energy injuries are strongly indicative of intercarpal ligament involvement. 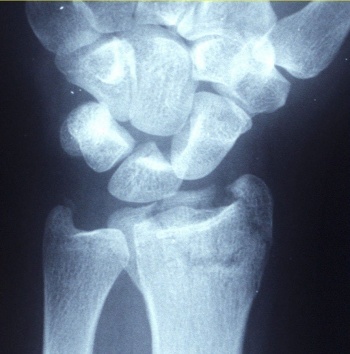 To confirm the diagnosis, x-rays can identify fracture, displacement as well as the number of bony fragments. When the fracture is in an acceptable position, a plaster cast can be applied until the bone heals. If the fracture is displaced, the fragments are realigned (reduced), after which a splint or cast is applied. The cast will be changed two to three weeks after application as the swelling decreases and then removed six weeks after the reduction, assuming an acceptable level of healing has occurred. After this, physical therapy can start to improve the function of the injured wrist. If the displaced of the fracture is large enough that reduction is insufficient to achieve acceptable position of the bones, surgery is required. Orthopedic surgeons typically recommend surgical repair of displaced articular fractures of the distal radius for active, healthy people. The sheer variety of reduction and fixation options is clear given the publication of a series of five Cochrane reviews focusing on this topic alone. Methods include: 1) closed reduction and percutaneous pinning, either extra-focal or intra-focal, 2) bridging external fixation with or without supplemental Kirschner-wire fixation, 3) dorsal plating, 4) fragment-specific fixation, 5) open reduction and internal fixation with a volar plate through a classic Henry approach, 6) a combination of these methods. According to Bushnell and Bynum (2007), surgical “complications include edema, hematoma, stiffness, infection, neurovascular injury, loss of fixation, recurrent malunion, nonunion or delayed union, instability, tendon irritation or ruptures, osteoarthritis, residual ulnar-side pain, median neuropathy, complex regional pain syndrome, and problems with the bone-graft harvest site." External Fixation – External fixation is typically a closed, minimally invasive method in which metal pins or screws are driven into the bone via small incisions in the skin. These pins can then be fixed externally by either a plaster cast or secured into an external fixator frame. In comparison to a standard immobilization procedure, external fixation of distal radius fractures reduces redisplacement and yields better anatomical results. However, current evidence for better functional outcomes from external fixation is weak and is also associated with high risk for complications such as pin site infections and radial nerve injuries. Internal fixation – Internal fixation involves open surgery where the fractured bone is exposed. Dorsal, volar or T-plates with screws may be ued. However, due to the invasive and demanding nature of open surgery, there is an increased risk of infection and soft-tissue damage and therefore this type of fixation is usually reserved for more severe injuries. Bone Grafts - Upon reduction of distal radial fractures, bony voids are common and can be reduced by inserting bone grafts or bone graft substitutes. Autogenous bone material obtained from the patient themselves or allogenous bone material obtained from cadaver or live donors can be used as filler for reducing bony voids. However, there is a risk of complications including infection, nerve injury or donor site pain, and there is limited evidence that bone scaffolding may improve anatomical or functional outcomes. Bone grafting is required by most procedures except closing wedge. Percutaneous Pinning - Another strategy in reducing and stabilizing the fractures is percutaneous pinning, which involves insertion of pins, threads or wires through the skin and into the bone. This procedure is typically less invasive and reduction of the fracture is closed upon which the pins placed in the bone are used to fix the distal radial fragment. Current indications for the best technique of pinning, the extent and duration of immobilization are uncertain, thus the risk of complications likely outweighs the therapeutic benefits of pinning. Closed Reduction - In closed reduction, displaced radial fragments are repositioned using different maneuvers while the arm is in traction. 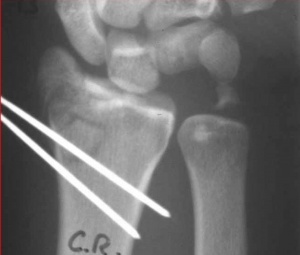 Different methods include manual reduction in which two people pull in the opposite directions to produce and maintain longitudinal traction and mechanical methods of reduction including the use of “finger traps.” However there is insufficient evidence establishing the effectiveness of different methods of closed reduction used in treating distal radial fractures. Arthroscopic-assisted reduction - This technique has many advantages over open reduction. In addition to being less invasive, it allows for direct visualization and reduction of articular displacement, the opportunity to diagnose and treat associated ligamentous injuries, the removal of articular cartilage debris as well as lavage of the radiocarpal joint. The primary limitations for arthroscopic reduction are due the limited number of surgeons with experience, a longer, more difficult procedure, and the potential for compartment syndrome or acute carpal tunnel syndrome with fluid extravasation. Current physical therapy management for distal radius fractures covers post-surgical or post-immobilization treatment. (Level of Evidence=1B) The treatment of distal radius fractures is controversial and further research is required. There is a great need for versatility in treatment options and there is no gold standard. The best treatment option must be decided in accordance to the type of fracture evaluated from the radiographs after temporary reduction. Use of self-management approaches help in developing positive health behaviors during rehabilitation. Self-management programs can provide benefits in participant knowledge, symptom management, self-efficacy and aspects of health status. These programs are usually given to patients with chronic illnesses. Ice, elevation and non-prescription medications for pain relief are typically sufficient for relieving pain for this type of injury. Michlovitz et al (2001) published the findings of a survey of physiotherapists, occupational therapists and certified hand therapists to determine common practices in the rehabilitation of patients with DRFs. Less than 10% of DRF caseloads are referred for therapy during this stage. Priorities during immobilization include edema, finger stiffness and patient education. Home exercise programs are typically provided, addressing ROM of the shoulder, elbow and fingers. Hot/cold modalities may be applied for pain management. Compressive wraps and retrograde massage may be used for management of edema. In 50% of cases, resting splints were used for support and protection. Ninety percent of surveyed therapists include hot/cold modalities and ROM exercises at this stage. Eighty percent use compressive wraps with retrograde massage, dexterity exercises, joint mobilization and soft tissue mobilization. Almost 90% also used strengthening exercises to improve both strength and function. Static or dynamic splints (or both) can be used to address joint stiffness. Smith et al (2004) provided the following summary of post-surgical rehabilitation techniques. Because distal radius fractures are so varied and the treatment options are so broad, recovery is different for each individual. Consultation with the treating surgeon may be required to determine when return to various activities can occur. During the first two months post-surgery, patients report severe pain during movement and severe disability during activities of daily living as assessed with valid and reliable outcome measures such as the Patient Rated Wrist Evaluation (PRWE) and the Disabilities of the Arm, Shoulder, and Hand Questionnaire (DASH). These self-reported deficits are reflected in decreased ROM and decreased grip strength measurements with strength more correlated with functional ability. Most patients achieve the majority of recovery within the first six months. A small minority of patients will experience persistent pain and disability at one year post-injury regardless of treatment protocol,   especially when pushing up from sit to stand and when carrying weight. Patients expressing atypical recovery from distal radial fractures need modified treatment programs with goals toward increasing level of function. Handoll et al conducted eight Cochrane Reviews targeting distal radial fractures. There was insufficient data from which to draw conclusions. This may be due to poor study design and the heterogeneity of distal radial fractures themselves. In a randomized control trial, Kay et al (2008) were supportive of physical therapy intervention, although limitations in the study abound. While no significant differences in grip strength and wrist extension were found in the experimental group, it is important to note that some of the secondary measures showed significant improvement as compared to the control group. These include benefits in activity, pain and satisfaction. Due to the fact that distal radial fractures are one of the most common injuries in orthopedics, it is important for physical therapists to understand the risk factors and treatment options. Although further research is needed to ascertain proper post surgical management, it is recommended based on current evidence that patients should be routinely referred to a physical therapist for education and an exercise program. ↑ 2.0 2.1 2.2 2.3 2.4 2.5 2.6 Handoll HHG, Huntley JS, Madhok R. External Fixation versus conservative treatment for distal radial fractures in adults (Review). The Cochrane Library. 2008;4:1-78. ↑ 3.0 3.1 3.2 3.3 3.4 Handoll HHG, Huntley JS, Madhok R. Different methods of external fixation for treating distal radial fractures in adults (Review). The Cochrane Library. 2008;4:1-67. ↑ Kenneth J. Koval, Joseph D. Zuckerman, Handbook of fractures, Philadelphia, second edition, 1994, pg 134. ↑ 7.0 7.1 7.2 7.3 7.4 7.5 7.6 Bienek T, Kusz D, Cielinski L. Peripheral nerve compression neuropathy after fractures of the distal radius. J Hand Surg. (British and European Volume). 2006;31B(3):256-260. ↑ Leung F, Ozkan M, Chow SP. Conservative treatment of intra-articular fractures of the distal radius – factors affecting functional outcomes. Hand Surg. 2000;5(2):145-153. ↑ 13.0 13.1 13.2 13.3 13.4 13.5 13.6 Bushnell BD, Bynum DK. Malunion of the distal radius. J Am Acad Orthop Surg. 2007;15:27-40. ↑ 15.0 15.1 Oren T, Wolf J. Soft- Tissue complications associated with distal radius fractures. Operative Techniques in Orthopaedics.19; 2009: 100—106. ↑ 16.0 16.1 16.2 Kleinman WB. Distal radius instability and stiffness; common complications of distal radius fractures. Hand Clin. 2010;26:245-264. ↑ 17.0 17.1 17.2 17.3 Handoll HHG, Madhok R. Conservative interventions for treating distal radial fractures in adults (Review). The Cochrane Library. 2008;4:1-112. ↑ 18.00 18.01 18.02 18.03 18.04 18.05 18.06 18.07 18.08 18.09 18.10 Patel VP, Paksima N. Complications of distal radius fracture fixation. Bulletin of NYU Hospital for Joint Diseases. 2010;68(2):112-8. ↑ McKay SD, MacDermid JC, Roth JH, Richards Rs. “Assessment of complications of distal radius fractures and development of a complication checklist.” J. Hand Surg. Am., nr 5; 26, September 2001: 916-22. ↑ 20.0 20.1 20.2 20.3 20.4 Walenkamp M., et al. Surgery versus conservative treatment in patients with type A distal radius fractures, a randomised controlled trial. BMC Musculoskeletal disorders 2014, 15:90. ↑ 22.0 22.1 22.2 Leone J, Bhandari M, Adili A, McKenzie S, Moro JK, Dunlop RB. Predictors of early and late instability following conservative treatment of exta-articular distal radius fractures. Arch Orthop Trauma Surg. 2004;124:38-41. ↑ 23.0 23.1 23.2 Herzberg G. Intra-articular fracture of the distal radius: arthroscopic-assisted reduction. J Hand Surg. 2010;35A:1517-1519. ↑ Handoll HHG, Huntley JS. Bone grafts and bone substitutes for treating distal radial fractures in adults (Review). The Cochrane Library. 2009;3:1-87. ↑ 26.0 26.1 Handoll HHG, Watts AC. Internal fixation and comparisons of different fixation methods for treating distal radial fractures in adults (Protocol). The Cochrane Library. 2008;4:1-14. ↑ Bruder A, Taylor N, Dodd K, Shields N. Physiotherapy intervention practice patterns used in rehabilitation after distal radius fracture. Physiotherapy. 2013. 99: 233-240. ↑ 28.0 28.1 Kay S, McMahon M, Stiller K. An advice and exercise program has some benefits over natural recovery after distal radius fracture. Australian Journal of Physiotherapy. 2008. 54(4): 253-259. ↑ 29.0 29.1 29.2 Michlovitz S., et al. Distal Radius Fractures: Therapy Practice Patterns. J Hand Ther. 2001; 14:4: 249-257. ↑ Smith DW, Brou KE, Henry MH. 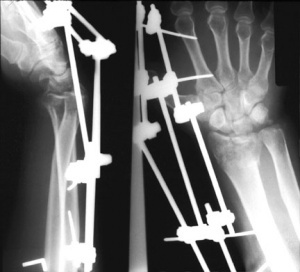 Early active rehabilitation for operatively stabilized distal radius fractures. J Hand Ther. 2004. 17(1): 43-49. ↑ 34.0 34.1 MacDermid JC, Roth JH, Richards RS. Pain and disability reported in the year following a distal radius fracture: A cohort study. BMC Musculoskelet Disord. 2003;4:24-36. ↑ Moore CM, Leonardi-Bee J. The prevalence of pain and disability one year post fracture of the distal radius in a UK population: A cross sectional survey. BMC Musculoskeletl Disord. 2008;9:129-138. ↑ Handoll HHG, Huntley JS, Madhok R. Closed reduction methods for treating distal radial fractures in adults (Review). The Cochrane Library. 2008;4:1-29. ↑ Handoll HHG, Vaghela MV, Madhok R. Percutaneous pinning for treating distal radial fractures in adults (Review). The Cochrane Library. 2008;4:1-70.